There is Austin. There is Seattle. There is Denver. And now there is Charlotte. It is America’s new hot spot and darling city. The place to be. The new #1. The only such city in the South. The challenge now: stay on top and grow the lead. Here are three ways to get it done. The excitement is palpable. Inescapable. Thrilling, even. 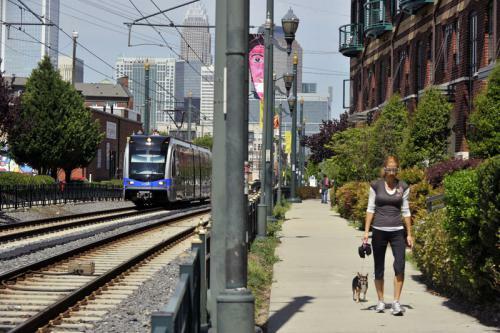 For all the growth Charlotte has had since 1990, more than doubling its metro-area population to 2.5 million, North Carolina’s largest city will welcome another million by 2035, according to U.S. Census projections. That’s just two decades from now. The pace during the last two decades (keep in mind, that takes us back only to 1996) moved the city’s planners and developers to focus on building a full Uptown (downtown) from virtually nothing to accommodate its Fortune 500 corporations and all the service companies coming in, create mass transit and light-rail lines from scratch, expand the Douglas International Airport (now the 6th busiest in all the world) and build new housing like mad. That was the rule book then, really up until this year. The one for the next 20 years and beyond is being written…now, today, as we speak. The Charlotte Chamber of Commerce, fresh off an Annual Meeting last week that featured a major strategy pivot, will soon launch a new Real Estate Council to “give thought to and guide future development across the city,” Council coordinator and Chamber SVP Kris Kellogg told us at a recent meeting, where we agreed to join the group as part of our new Chamber Board of Advisors membership. As we worked the room last week and spoke with developers and real-estate professionals during the reception, the vibe was clear: the growth that is coming is different from what has been, and that will require a fresh approach. The industry is not just scrambling to keep up with raw growth. It is scrambling to understand and build a new era. You can see in this recent story, this one on Brooklyn Village, and this one on the River District how some developers are adapting. It is a riveting narrative. Daniel Levine, Monte Ritchey, Don Peebles, Brian Leary, Johnny Harris, all members of the city’s development leadership, speak of the call for more authentic, human-scale, experience-driven lifestyles beyond the typical home-work-school routine, and a greater desire by people to connect with others in more tight-knit, dense and connected communities. They speak as well of a game-changing transition from sprawl to the city center, including the conversion or creation of higher-density city centers within suburban areas. There is also a renewed love of nature and trails, a lean toward health and sustainability, including a preference for alternative mobility over single-family cars. The sudden dawn of Uber and the coming revolution, likely rapid, of autonomous vehicles, is raising talk of a radical reduction in parking structures and a redrawing of neighborhood maps. At a recent meeting with representatives of Center City Partners, a nonprofit urban planning and development group, the conversation focused on this very thing, as Kyle Bridges, David McConnell, Erin Gillespie and Klint Mullis told us of their work talking developers into buying their stunning plans for a Rail Trail at South End, the tightly compact North Tryon, Brooklyn Village and Stonewall developments in Uptown, and the creation of a retail offering the city currently lacks, thus far unable to keep up with the rapid growth, among other CCP initiatives. The same applies to University City Partners, where Darlene Heater and Tobe Holmes are teaming up with multiple developers and property owners to bring far greater density, vibrancy and a renewed village concept to the vast area in and around the University of North Carolina at Charlotte and the Innovation Park office center eight miles northeast of Uptown. In a city accustomed to parading a string of #1 rankings (for small business, business growth, low cost of living, job growth and more), there is now a new one, and it is rocking the town. 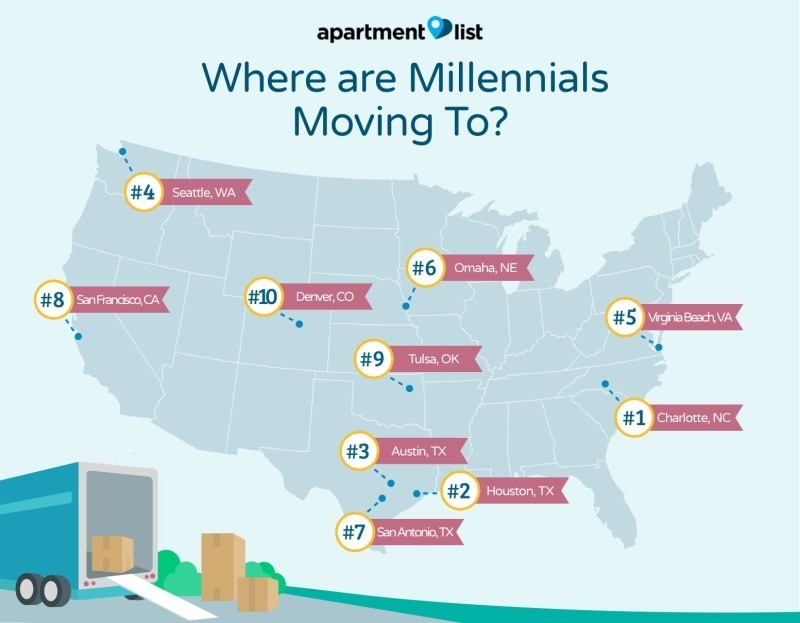 According to Apartment List, Charlotte has become the city in America with the fastest growth of the millennial population, a position coveted by every trendy city in the country, all making changes to attract what has become known as the $600 Billion Generation. 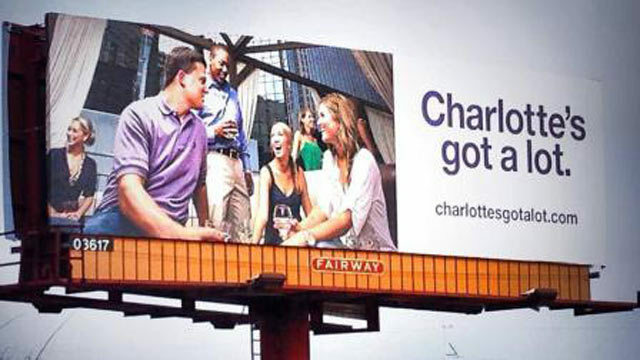 And Charlotte now ranks higher than Austin. Higher than Seattle. Higher than Denver. Interestingly, another review of the millennial phenom, which dissects what they look for in a city, doesn’t mention Charlotte as a top choice. The Apartment List data, on the other hand, shows where they are actually moving to! And on most counts, including the top three, CLT excels. The others represent our work in progress. The milestone helps explain the shift in thinking among developers, and will no doubt drive much of the discussion in the new Real Estate Council. What now? What else must we do to prepare Charlotte for the next million? And retain all those #1s. As the new architecture firm in town (we hail from Puerto Rico and Latin America), having inaugurated our office and U.S. expansion hub in Uptown a little over a month ago, this entire landscape has prompted a deep dive here at Integra into the future of the city, partly to define how we can fold in and add value, but also to contribute to the work at hand as new members of the development community. We call this process Future Thinking, part of our Better Way Forward approach to design and construction, and it yields three distinctive ways to go. With another million people coming in the next 20 years and the challenge to create an enduring city of global proportions, this becomes a primary challenge, and the answer is right in front of us: the 18-mile Blue Line light rail and 9-mile Gold Line streetcar, both part of the LYNX transit system. The Silver Line and West Corridor are also planned, but for now and perhaps for the rest of the century, the Blue and Gold ought to remain our focus of attention. The vision is anchored on the city’s proud history as a rail hub between North and South, East and West, as well as on the imperative of sustainable design, and finally on pure logic. It must happen along the LYNX. Life must happen along the LYNX. Work must happen along the LYNX. Entertainment. Tourism. When in Charlotte, you take the LYNX to go from spot to spot, people will come to learn. If you relocate to Charlotte, live along the LYNX and take the Blue and Gold to work, school, to eat or shop. To be sure, the LYNX is not for everyone. Lots of folks don’t ride it, and won’t. And that’s all right. But whether you do or not, the city gains to the extent it becomes our new density and activity axis. Over time, as the population growth materializes, the large empty space that is now the landscape along both lines, but especially the Blue south of New Bern station and the new northern route that opens next August, will fill in with office buildings, high-rise residential, retail, dining, hotels, movie houses, theatres, museums and other facilities. The right mix, along with building and urban design to ensure fantastic placemaking and aesthetics, will create what the Knight Foundation calls resident attachment, or love of place. It will also ensure vibrant tourism; visitors the world over are known to flock to such magnetic destinations. 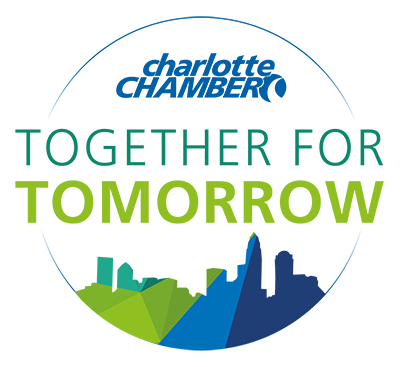 Charlotte already attracts millions of visitors annually for business (60% of total travel) and sports (roughly half of the balance), thanks to the visionary work of the Charlotte Regional Visitors Authority, Visit Charlotte and the Hospitality & Tourism Alliance. Business we’ve already mentioned. Sport is growing in importance, building on the success of NASCAR, the Panthers, Hornets, a year-long schedule of amateur tournaments, and a slate of events in the works, as we learned from HTA President Mohammad Jenatian and other members at a Board meeting last week. New LYNX destinations will give those visitors new places to go and will create attractions for a new wave of leisure travelers. That is especially so with what we at Integra call SPOTS, our initiative to design about a dozen of those locations as iconic, visually dramatic destinations, creating unique urban and tourism anchors along the Blue and Gold, including a string of niche hotels surrounded by thematic restaurants and high-impact retailtainment options. Already, Music Factory, NoDa, University Place, Plaza Midwood, South End and all of Uptown, including the new developments (North Tryon, Brooklyn Village, Stonewall and others), are on the LYNX (present and future). The breweries, the art, the culture, the vibe. That’s a super start and awesome locations to place this brand of new iconic attractions, as we multiply the number of cool things to do and places to go up and down the LYNX. The Blue and Gold will also be the core of Charlotte’s urban sustainability, since it will create the compactness and high density that is the hallmark of all great sustainable cities. When people crowd along transit, they drive less, bike and walk more and otherwise adopt alternative mobility, a practice promoted locally by the team at Sustain Charlotte (soon to include a special initiative we’re proud to join) and strengthened by the walkable and beautiful Little Sugar Creek Greenway. We need every such initiative we can get, given how low Charlotte is currently scoring in biking and walkability. And if existing buildings are retrofitted for high efficiency and new ones are built following the USGBC’s LEED guidelines, the green habit will become a new glorious normal to improve people’s health, save millions of dollars and slash carbon emissions. This is of great appeal to millennials and it creates yet another related benefit for the city. According to a recent McKinsey study, the greater the density in a city, the more people connect with one another and the more productive they become. A separate study by the Global Commission points to the monumental gains of avoiding urban sprawl and compacting people in concentrated areas: less infrastructure and transportation spending related to suburbia, less time wasted in congestion, less pollution-related health and regulatory expenses, dramatically lower use of energy, less social segregation, and more. That last point brings us to the second suggestion and one embraced with great conviction by the Charlotte Chamber last week. It is, in fact, the smart pivot mentioned earlier, as the Chamber has opened membership to the entire business community in the city, instead of its previous exclusivity, and is now fully engaged with other stakeholders in addressing Charlotte’s chronic inequality and segregation. Back to McKinsey: “When people are not included, they’re not able to contribute,” says the firm’s Jonathan Woetzel, who points to ways of avoiding gentrification even as districts become more appealing, as well as connecting underserved, nondigitalized or isolated communities with transit, trails, Internet, public spaces and other urban strategies. These are all contributions architecture can make when done right, and part of the value we aim to add in the months and years ahead. The more inclusive a city, adds the study, the greater the dispersion of people interactions, which in turn creates greater participation and social mobility, which draws in even more residents and companies. Two thirds of economic growth, says McKinsey, can be traced to dynamic population flows and new migration. Or in the words of Chamber President Bob Morgan, “when more people participate in economic activity, we grow as a city. That’s the importance of inclusion to business.” We could not agree more. Finally, there’s the Charlotte brand. What will we be known for as a city, that distinctive something that will accelerate and sustain our growth over time. New York has Manhattan and never sleeps. Paris is romance and fine living. Rome has its ancient history and modern design. Today, Charlotte is a draw as a business hub. Millennials come for the jobs, wages, weather and low cost of living, more so than for lifestyle amenities (which we now aim to create moving forward). Tourists come for the sports events. But from this moment on, as we get ready for the Next Million, we must reach deeper and offer something…bigger. May we suggest the concept of the New South, as captured by the Levine Museum of the New South, but with a twist, because the New South refers to the long period since the end of the Civil War. The South as captured by tomorrow’s Charlotte is remarkably different. The concept of The South Anew, therefore, seems a more appropriate description. Think about that for a minute. Charlotte is the first and only city that truly captures the essence of a South reborn for the 21st century, which includes the New South of the 20th, but now as the fastest growing city for millennials, still the second largest financial center in America and the region’s new business hub, The South Anew describes a clear departure. We can even become the first southern tourism destination to break into the top 10 travel sites in the country (today they’re all outside the South). People will want to visit Charlotte, move to Charlotte, relocate their headquarters in Charlotte, because of this uniquely southern proposition, in addition to the tangible advantages the city offers. And the LYNX urban anchor and urban magnet will give them greater reason, as it will give the city a newfound grandeur, urban distinctiveness and simply make Charlotte a fun, kickass place to be. The South Anew is a rethinking of the South, the hospitality of old AND the modern urbanism of today and tomorrow. As we and our sister architecture firms in the industry move to design the properties along the LYNX and elsewhere in Mecklenburg and surrounding counties over the next two decades, it will help to have a clear brand such as this. One anchored on the idea of The South Anew would provide a certain development code for our buildings and urban spaces. That’s the relevance, and it’s part of the conversation we must now have as we get ready for the Next Million. 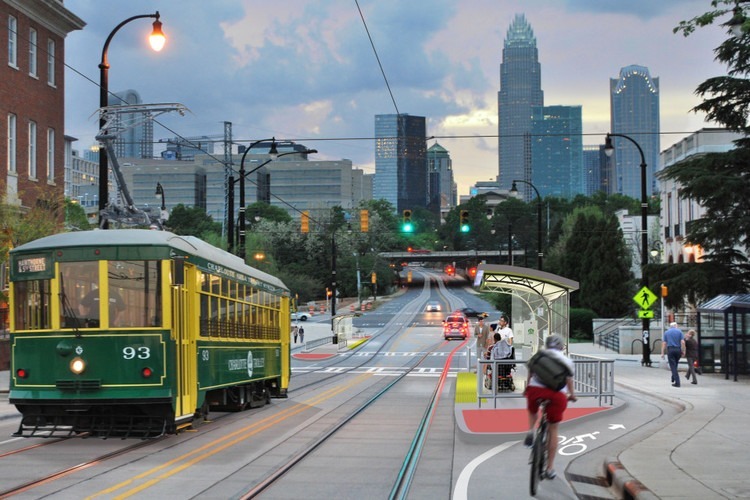 Our thanks to the Fisher Law Group and its Buzz City Banter for the great Gold Line header-image rendering. Alex Díaz is Business Development Manager at Integra Architecture & Design Group, in charge of partnerships and communications for the U.S. market from the firm's hub office in Charlotte, North Carolina.